You are here: HomenextPlacesnextShops and businessesnextDo you remember the shop?nextDo you remember the shop? 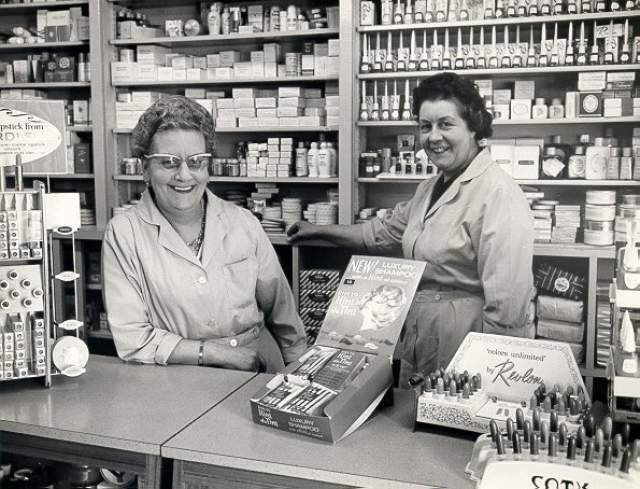 Who are these ladies – where was their shop? I have recently been trawling through a selection of photographs from a collection from Brighton Museum. These two ladies smiling at the camera caught my eye. The photograph was clearly taken quite a few years ago. Do you recognise them? What about the shop? Or was this a cosmetic counter in a large store? If you can suggest any clues, please leave a comment below. Just a guess but it looks to be part of a larger store or a large chemist such as Parris & Greening? I think its Boots the Chemist of North Street.